Updated with some new pictures, additional text, and recipe re-write (originally posted March 6, 2017). This is my go-to green smoothie. I make it whenever I’m looking for a quick and delicious way to get more fruits and vegetables into my diet. I have a particular craving for this smoothie after consuming half of a Costco pizza (they’re not small) on a Friday night. It’s tasty, healthy, and comes together quickly with just a few ingredients. 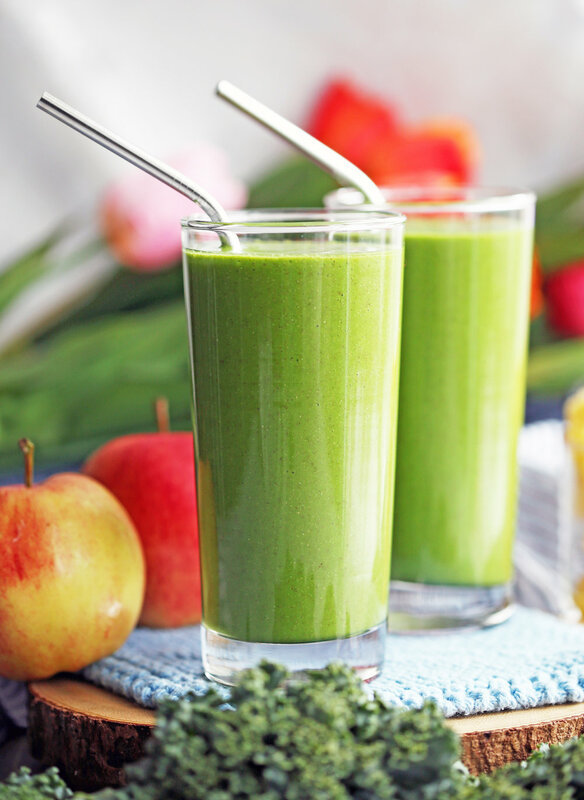 I hope you enjoy this recipe for Kale Pineapple Chia Smoothies! How do you make this green smoothie? 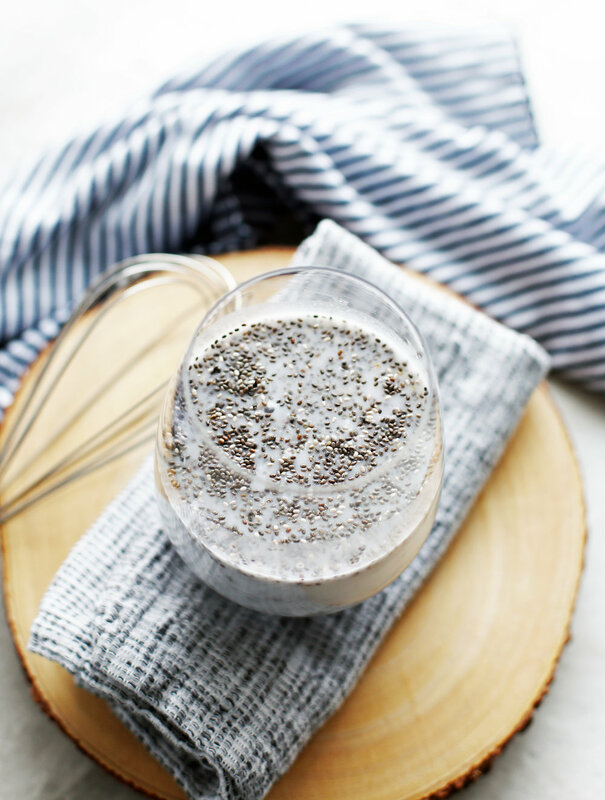 Whisk together chia seeds and coconut milk in glass or bowl. Refrigerate for 8 minutes. Full ingredients amounts and complete instructions in the recipe card down below. Why soak the chia seeds? The chia seeds develop a gelatinous coating (kind of a tapioca pudding texture) when soaked in liquid, which thickens the smoothie and helps it blend more easily to create a satisfying creamier texture. As the chia seeds gel up, prepare the other ingredients like chopping up the kale and apples and measuring out the ingredients. Of course since this is a smoothie, you can add more or less of each ingredient to get to the taste that you like. Then place all the ingredients in a high powered blender and blend until smooth. Best enjoyed immediately. This smoothie is good for you. In particular, raw kale is low in calories, very high in vitamin K, a rich source of vitamin A, B6, C, and folate while chia seeds are rich in omega-3 fatty acids, high in protein, and full of vitamins and minerals such as calcium, iron, and magnesium. 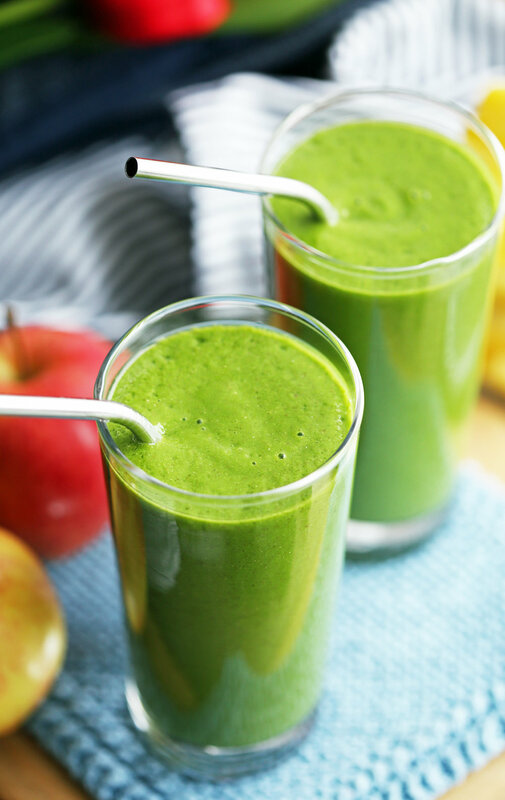 Apple (I like Gala apples) and frozen pineapple chunks not only add natural sweet and tart flavours, but also are a good source of dietary fiber, antioxidants, and vitamins C.
Love easy green smoothie recipes? Check out these three tasty drinks! Delicious and creamy: It has tasty naturally sweet and lightly tart flavours from the fruit. Healthy: It’s nutrient-rich and full of vitamins and minerals. Super easy and quick to make: It takes about 10 minutes and has just a few simple instructions. Perfect for breakfast or as a snack: Pour into your favourite travel cup and take it on-the-go. I hope you enjoy this smoothie! If you make this recipe, please leave me a rating and comment down below or tag me on any of my social media. I’m @yay_for_food on Instagram. Please share your recipe pictures! In a small cup (or bowl), whisk together the chia seeds and coconut milk. Refrigerate for 8 minutes allowing the chia seeds to gel up. Give the chia seed and milk mixture a stir before placing in a high-powered blender along with the rest of the ingredients. Blend until smooth. Taste and adjust according to preferences such as adding more milk to thin out the smoothie or more pineapple for additional sweetness. Enjoy!